Nobody can really write the singular plot lines like Chuck Palahniuk and still manage to make it pay dividends. Not really. 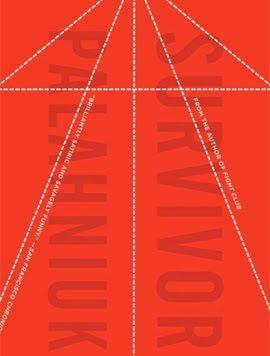 And in his recently reissued (for e-readers) expedition into evilly amusing satire, Survivor, Palahniuk does exactly that. Survivor, which was originally published in 1999 as his follow up to Fight Club, keeps a brisk pace as the anti-protagonist, Tender Branson, races to his own demise (maybe). He certainly captured the tone of the time, a nation caught between taking pride in its ability to make everything seem larger than life and its disgust over making the most inane twice as big. It still plays that way sometimes today, which perhaps is why Survivor reads as fresh as if it was published yesterday. Americans love to elevate the thinnest of personalities to the highest possible pedestal before tearing them down. It's almost one of the most spectacular spectator sports created, even if Branson is secretly more complex in his own way. An anti-protagonist with a few complex and twisted layers of secrecy. On the surface, Branson doesn't amount to much as a man. He's one of the last surviving members of a religious cult that committed mass suicide as the federal government had begun to investigate allegations of crimes against children. Branson is one of them, sent out beyond the protective confines of the community to live a solitary life as a personal assistant/ house manager for the newly rich; people who couldn't eat a lobster without an instruction manual. Most of the money he makes is sent back to the elders. He's a nobody, born and bred to be a solo servant for the greater glory. He's almost more complex, however, secretly taking delight in giving his outer world charges one-off instructions, maintaining their prized garden of stolen funeral flowers, and answering a suicide hotline with two catastrophic words of advice: kill yourself. Branson might have gone on that way, happily miserable enough, for the remainder of his life. But then everything changed when he presumably becomes the target of the cult's cleanup crew — someone who is all too happy to assist any of those who escaped The Deliverance. “Maybe we have to break everything to make something better out of ourselves.” — Chuck Palahniuk. By taking a page from the history of public relations (propaganda), Palahniuk offers up an escape for Branson. As soon as he becomes what most of the world believes to be the last "Creedish" cult member, Branson is invited to become one of those larger than life celebrities. Everything has been prepared for him well in advance, starting with an autobiography prewritten as a composite of virtually every other cult that committed suicide. And since no one will be around to refute the sole survivor, the story of his sect miraculously matches whatever the ghost writers made up. But that's only the beginning. Branson is destined to become a brand, one that the public relations crew has painstakingly crafted from market research to have the most impact and money making potential. All Branson has to do is adjust, lose a few pounds, receive a few treatments, and find his life managed by even more than the rigorous schedule he was forced to keep as a rented out servant. Branson doesn't go it alone either. He stumbles across more than his fair share of adversarial allies, including the agent, his brother, and most notably the object of his desire — Fertility Hollis, a pale-skinned girl with fire red hair who happens to be the sister of a suicide caller that Branson assisted to his grave. The first rule of any Palahniuk book is that there are no rules. Much like with Fight Club, which blazed onto the screen with the help of David Fincher, Palahniuk is a master at translating his freelance journalist skill sets into writing tight novels (although he also credits Tom Spanbauer for a minimalist style). Some people even wonder how he can possibly pack so much into 289 pages. Palahniuk didn't begin writing fiction until his mid-thirties. He started after attending a writer's workshop, hosted by Spanbauer. Before that, he initially used his degree from University of Oregon's School of Journalism to secure a position at a local Portland newspaper before abandoning it to work as a diesel mechanic for Freightliner trucks. Occasionally he wrote manuals on how to fix trucks and freelanced. He later quit that job to become a near full-time volunteer and a member of the rebellious Cacophony Society, which is said to have inspired Project Mayhem. And that is perhaps one of the most striking things about Palahniuk. He dares people to live life, not allow it to become meaningless by being a spectator. 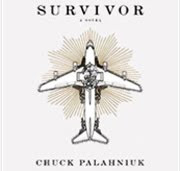 Survivor By Chuck Palahniuk Flies To A 7.2 On The Liquid Hip Richter Scale. Survivor is a fast read, quick page burner that continuously teases you along to see what's next, question what's real or imagined, and give up any preconceived notions that anything is a hint of where the story might end up. It's a classic in capturing his early work at marginalizing characters who eventually self-destruct. Survivor: A Novel is available on Amazon and the book can be found at Barnes & Noble. You can also download the novel on iBooks from iTunes, which also carries the audiobook. If you opt for audio, make sure you listen to the sample clip by Paul Garcia. Personally, I would have never imagined Branson to sound the same.